Home » Uncategorized » TOILET PAPER!!!! 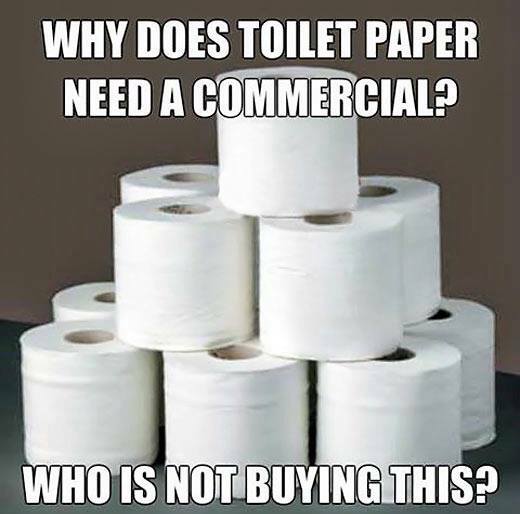 This week we will talk about TOILET PAPER!! Yay! What fun?! What fun?! Who doesn’t LOVE talking about the substance we use to wipe the most disgusting items from our body?! Hip hip hooray!! I know I have you going on a toilet-paper-celebrating-frenzy, but to be honest, toilet paper is no laughing matter when it comes to your septic system. Believe it or not, using the wrong toilet paper can clog your system and leave you with a HUGE mess. So, how do you know if you’re using the wrong toilet paper? Unfortunately, all toilet papers claim to be “septic safe.” This can be really confusing to the “new to septic” homeowner. I’m sure all toilet papers will eventually break down once they get to the tank, but here’s the problem – if they are thicker, 3 ply, quilted toilet paper, they struggle to make it to the tank. When you use cheap, single ply toilet paper, the minute it hits the water and gets even the slightest agitation, it will start breaking down into tiny pieces. This is perfect for a septic system because tiny pieces do not get stuck in the line or in the baffle region of the tank. Therefore, tiny pieces don’t cause clogs, which in turn don’t cause back-ups into your house. Score for cheap toilet paper!! Woo hoo! When you use nice, thick, 3 ply, quilted paper it behaves just the opposite. It maintains its integrity in the line and then gets caught. One piece of toilet paper laying in your line isn’t a huge deal, but let’s say you flush some more, and then some more. All those pieces start catching on each other and form themselves their own little toilet paper gang. Their initiation requirements? To plug your line and destroy your hopes and dreams with a nasty back-up on a night when you have planned your biggest gathering of the century in your home! Okay, maybe it’s not QUITE that dramatic, but it is gross and messy. And, all this I just described can be eliminated by using cheap, 1 ply toilet paper. This same idea applies to paper towels, wet wipes and feminine products. None of these things break down when they make contact with water and can eventually cause you trouble. It’s just not worth it, if you ask me.